The personal is the political. It’s an adage that I’ve often heard, but it was TWC2’s day school about migrant workers that brought it home. 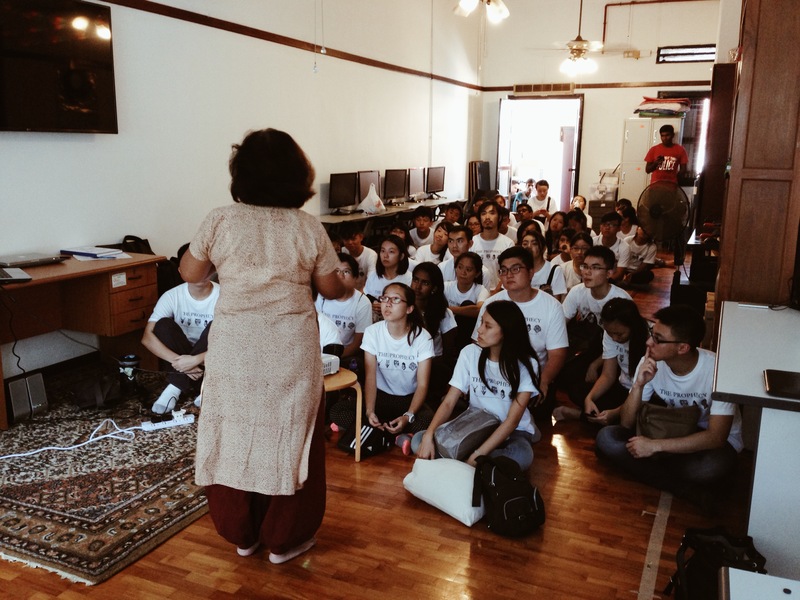 Yesterday afternoon at 2 pm, TWC2 hosted a group of about 40 students from the College of Alice and Peter Tan (CAPT) to give them an overview of the issues that migrant workers in Singapore face. TWC2 often hosts these day schools to reach out to students and spark questions, conversations, and debates. 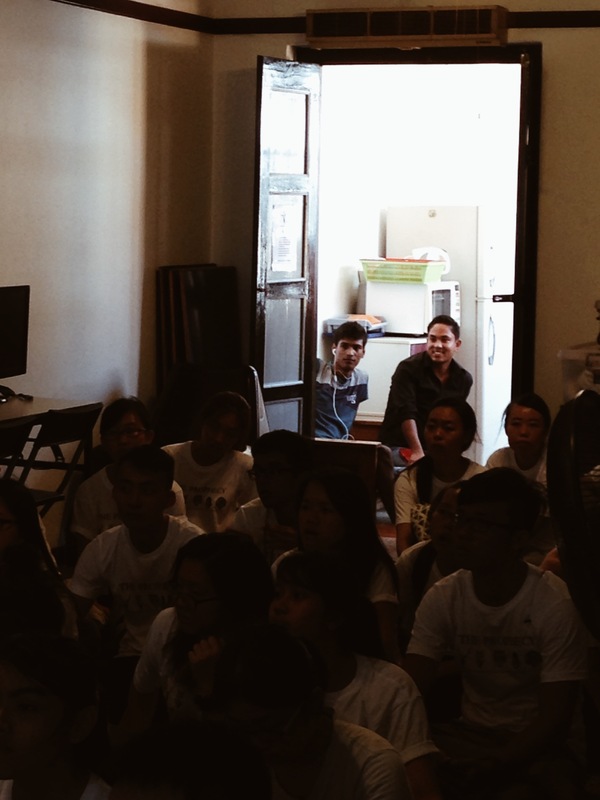 Shona killing it during her presentation to a group of College and Alice Peter Tan (CAPT) students. Construction workers work ‘dirty, demeaning and dangerous’ jobs, and they carry on their shoulders a huge debt when they do so. Aziz, who was present that day at TWC2’s Day Space in Little India, smiles as he sees a picture of himself in Shona’s presentation. Debbie Fordyce quips that he is often present at public education events because he is very handsome! The presentation was focused on construction workers, but Alex Ma (the current MOOP intern here at ARI) and I had put together a handout on domestic workers based on some previous ARI work, which we distributed to the students before the Q&A session. Some of the students asked some bright questions, which were fielded by Debbie, Shona, and Christine. Q. What proportion of workers in Singapore face injury problems or issues with compensation? A: It’s hard to say as we don’t see every injured construction worker: many fall through the cracks. Most construction workers we see also tend to be South Asian, and Chinese construction workers may seek help elsewhere. It’s more important to acknowledge the structural issues that leave construction workers in a vulnerable position in Singapore, and to focus on employers who may not be doing right by construction workers. I (Kellynn) want to add that construction work in Singapore accounted for the highest workplace fatality rate in 2013 [Source]. In 2014, the first three months of the year yielded 12 fatalities–a construction worker died every week due to lapses in workplace safety or accidents [Source]. These may not necessarily mean foreign worker deaths, but it does give a glimpse of how risky construction work can be. The Baey & Yeoh (2015) report I linked to earlier pointed out that most Bangladeshi men who migrate to Singapore are middle-class, relatively highly-educated men who have the means to migrate–not actual construction workers in Bangladesh, who are too poor to pay so much upfront for a job in Singapore. So the men who come here are often not always the most experienced, or may not be assigned to jobs that they are actually trained for. Q. Why does the kafala system in Singapore exist? A: Essentially, it’s to co-opt employers to help the state regulate the movement and mobility of low-waged migrant labourers in Singapore. For instance, it means that employers are the ones who are responsible for repatriating workers, which makes it easier for the state to regulate its national borders. In the case of domestic workers, both the monthly maid levy and the security bond serve to act as instruments which ensure that employers keep an eye on their domestic worker and ensure that they not violate their Work Permit conditions. Employers do not want to lose the hefty sum they have invested in migrant workers! Christine Pelly welcoming the CAPT students. Q. How can we, as a community, help foreign workers? Not at the policy level or the NGO level, but on a day-to-day basis? This was the question that got me. I stood there, deliberating, as Shona, Debbie, and Christine took turns to offer great suggestions: get to know the migrant workers around you. Raise these issues to your family and friends. Remember that they are individuals who often come here under a huge debt or under the burden of repaying debts through monthly salary deductions. Advocate for them; bureaucracy can be dizzying for those unfamiliar with the English language, and the power differential between worker and employer can mean that it can be hard to ask for medical treatment, for CCTV footage to prove an injury claim, or for a day off. Real life is not a Powerpoint slide or a set of policy recommendations. It is easy to suggest ways to change the system, but difficult when it comes down to carrying them out on a personal level. My family hires a domestic worker, and the stuff that I advocate for in public spaces like this is not stuff that I would say at home. There are many reasons for this–family can be tricky to navigate and there are power differentials that are built into a parent-child relationship. I am reluctant to cause conflict and tension in my home. I can do small things in small ways: chat with my domestic worker to get to know her and her family, try to persuade my mother to hire workers from employment agencies with low ‘maid loans’ so that her salary deductions are not so protracted, or suggest that we send our domestic worker on weekly training courses or classes so that she has greater mobility and a chance to experience Singapore. Saying this was a moment of brute honesty, and it felt concessionary and hypocritical to say these things. They are also things I had never said to a public audience before, despite having volunteered with TWC2 for years, and having spent most of my academic life in school and at work researching and presenting about domestic workers in Singapore. It felt like a confession of a disjuncture between my personal life and my professional/public life. But here’s the thing: real life is messy. Advocacy is not always grand or noble or clean or sweeping. Employers are often painted as heartless, and sometimes–and here I take off my academic hat–it seems like they truly are. 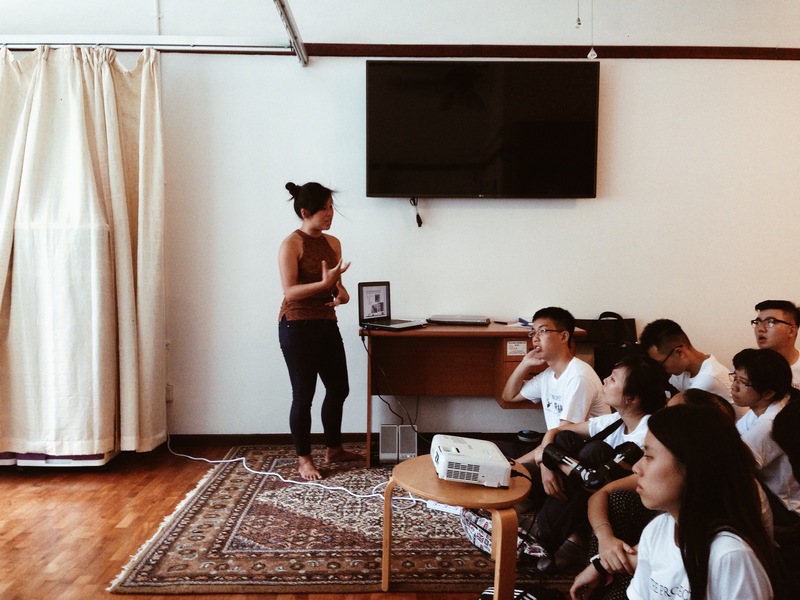 Before the day school, Christine shared a story of a domestic worker who was not allowed to take showers at home because it amounted to a ‘wastage’ of water. She was told to go to the rubbish bin center beneath her condominium to shower, using a hose. She has not been paid for a year. Are we inured to these stories, or do we continue to be shocked at how precise human beings can be when humiliating one another? The reality for many university students of a certain level of wealth or belonging to a certain class is that many of us do hire domestic workers, or know people who do. Employers are not just ’employers’, but they are also mothers or aunts or grandmothers. Sometimes, your loved ones are the hardest to stand up to, especially when you try to translate what you learn in your classroom to the diffused and often confusing reality of day-to-day life. My parents are genuinely kind individuals; they are warm and they are willing to listen. They did not have the privilege of the kind of education that I have been given. Do we have different opinions about labour rights and the treatment of migrant workers? Yes. But have they listened to what I have had to say? Also, yes. Is it true that a domestic worker and the family she works for face many everyday tensions borne of cultural anxieties and assumptions? Yes. Are we quick to defend those we love over those from elsewhere? The truth is: yes. During my commencement dinner, a professor gave a speech where he said that we no longer believe we are starry-eyed dreamers who can change the world, but we should believe that we are individuals who can effect small, everyday revolutions. And here, I think, is where we start. Debbie said to the CAPT students: “you are intelligent children who will change your parents’ minds, if you really want to.” And I think this is something that continues to ring in my mind when it comes to research and advocacy, as well.